So, you have decided that in-home therapy is the right move for you and your child. You’ve had the referral and the assessment, and the insurance company says yes—you’re all set, right? Well, almost! Before the therapist even rings the doorbell, take a moment to read eight tips for therapy survival to help make your sessions a positive and successful experience for everyone. 1. Prepare your child as much as you can for each therapy session. All kids are different, and “getting ready” will differ for everyone, making it important to develop a routine to help your child be ready mentally and physically for therapy. Let him/her know who is coming, why, and when. In our house, we have a couple of countdowns, and five minutes before arrival time, we go to the bathroom to wash hands and clean our glasses. We also have a reminder about listening and paying attention, iPads go away, and we have some quiet time. We are ready when the therapist walks in to start work. 2. If space allows, dedicate a bathroom and workspace for the therapist. Even if this is not possible, ensure he/she has a separate clean towel or paper towels, a trash can, and soap. A designated working space is also appreciated—often there is a lot of paperwork, toys, and props, and he/she needs space to conduct the session. Having a designated space, even if it’s the dining room table, allows the therapist to spread out without feeling like he/she is encroaching on your space. 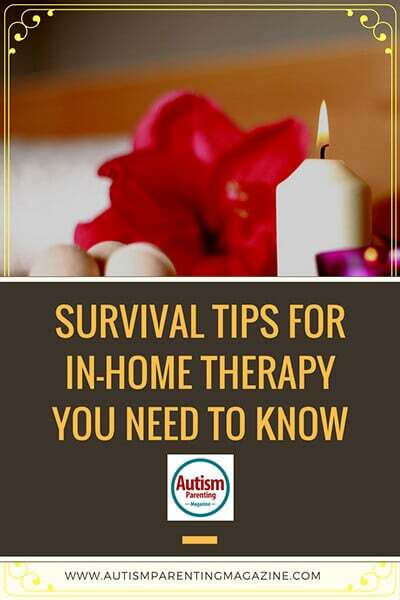 3, Set clear rules for your home and convey them to the therapist. If you prefer shoes are not worn in your home, let him/her know up front. Therapists are not mind-readers, and letting them know boundaries will make you both feel more relaxed and will help eliminate future grievances. Decide ahead of time if it is OK if he/she heats up food in your home; if the therapist can go anywhere in your house, or if there are places off-limits; if the therapist can take your child outside. A major issue for me was when a new therapist decided to take my son for a walk to work on “following directions.” She didn’t ask—just left the home and it was over 90 degrees outside. My poor kid came back looking hot, sweaty, and lobster-faced. A new rule was instigated—no one leaves the home without my permission. 4. Discuss which treats and rewards are acceptable as reinforcers for your child. If you don’t want your kids eating their own body weight in Sour Patch Kids during a session, let the therapist know. Provide healthy alternatives such as fruit-based snacks or discuss with some non-food, preferred items that would work for your child. My kids are both currently motivated by the chance to handle some “slime,” for example. 5. Keep a wish list on the wall of the room they work in—therapists can add any items needed such as crayons, glue, and tissues ahead of time. You can then grab the list and purchase items when it’s convenient for you. Finding a pack of colored pipe cleaners and a pack of googly eyes at a moment’s notice is never fun. 6. At the end of each session, ask the therapist for feedback. What did he/she do today, and how did your child fare? Ask what you as a parent or care-giver can do now to reinforce those ideas and continue the learning. Take time to understand the techniques being taught so you can ensure continuity. If your child has been learning a “please and thank you” song, learn it, too, and sing it with your child—and be sure to make a big deal about praising good manners when they are used appropriately. 7. Keep your relationship with your therapist professional at all times. Small talk and friendly exchanges are to be encouraged, but keep the body of discussion centered on your child and the therapy. Getting too close can blur the lines. Aim for fostering a happy working relationship rather than friendship, and address any serious issues or concerns with his/her supervisor. 8. Don’t interfere in the therapy once it is underway. Save your questions for the end of the sessions. Therapy is not always easy, and there may be tears and tantrums as the child is stretched by new demands, or as things become frustrating. Your child will likely be distracted or react differently when you are present and will try to use you as an escape from the tasks set. Caroline Mitchell is a British expat now living in sunny Florida. She is a dedicated mom of eight-year-old twins with autism receiving multiple in-home therapies including 30 hours of ABA therapy a week. She is chief cook and bottle-washer of Chez Mitchell where she somehow finds time to run a successful Central Florida real estate team, homeschool her children, and write stories for kids on the spectrum.